As another year winds to a finish, it's time to look forward with a real estate forecast for the coming year. 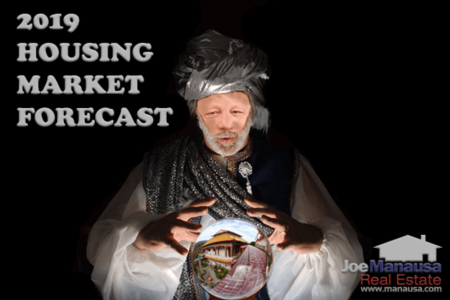 Long time readers of the Tallahassee Real Estate Blog might remember past efforts to predict the real estate activity for the coming years. My real estate forecast for 2012 was spot-on, and my past five years efforts have been very close. (For those that are interested, you can find my past real estate forecasts here). But the real estate forecast for 2013 is going to be the toughest one since 2006. 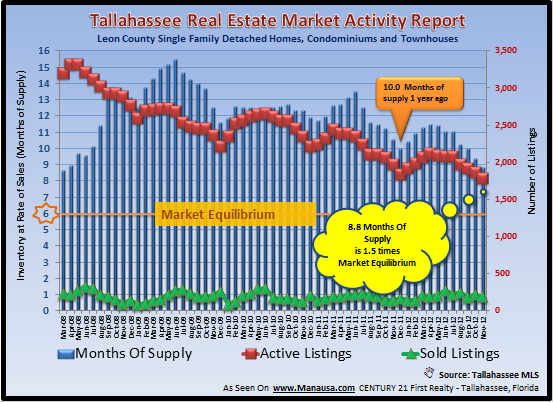 The housing market in Tallahassee appears to be leaving a market bottom (for the final time I hope). Homebuyer activity is on the rise for the first time since the Homebuyer Tax Credit created a temporary recovery back in 2010. But I believe this time it is for real. The real estate graph above shows that 2012 will record more home sales than 2009, 2010, and 2011, and possibly 2008 as well. While the total number of home sales is not where it once was, I think this upward move is a trend that will continue. Of course, the graph also shows that 38% of the homes sold last year were distressed, and that trend is going to continue higher for quite some time. In fact, our real estate forecast for 2013 is quite bullish for this very reason. Distressed homes for sale in Tallahassee are very tempting at these low prices, and low interest rates make them super affordable. For six straight years, property values have fallen in the Tallahassee real estate market. While many real estate reports try to confuse us about property prices versus property values, the graph below is simple and clear, values are falling. 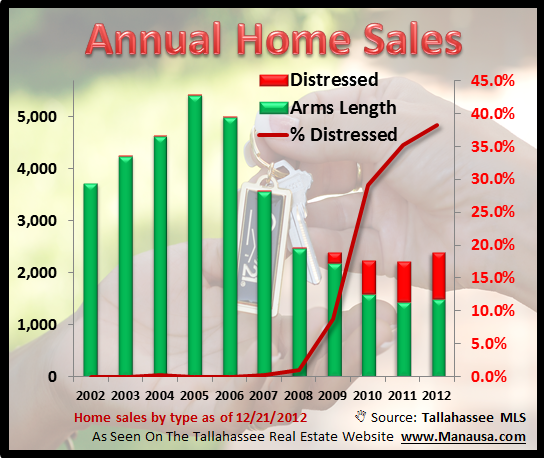 In the graph above, the green and red bars record the number of arms length and distressed home sales (respectively), while the green and red lines show their respective values. Arms length home values will begin the 7th consecutive year of declining values, and the rate of decline is what makes this year's real estate forecast so difficult. 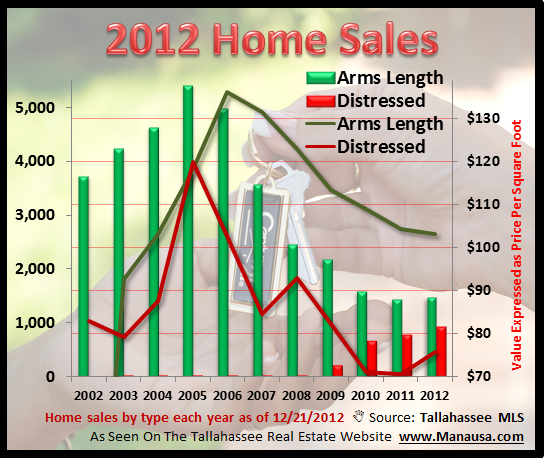 It's all dependent on the distressed properties for sale in Tallahassee. If they hit the market too rapidly, values will decline at a higher rate. If they enter the market very slowly, values will stay fairly stable, but the recovery will take much longer. Ultimately, the demand side of the market is returning, so the question will be "how will the supply side respond?" We have written numerous articles on the supply side of the Tallahassee housing market. Long time readers download our monthly Tallahassee Housing Report to stay current on niche price range movements. Consumers should be aware of the shadow inventory of homes and the forgotten inventory of homes, both of which are poised on the sidelines to enter the housing market as soon as there appears to be ample demand. Additionally, the current supply of homes has been correcting nicely, but still represents 1.5x the amount needed to balance the market at our current rate of demand. The real estate graph above shows that real supply (red) is falling, demand (green) is rising slightly, thus the relative supply of homes (blue) is at its lowest level since 2008. Were it not for all the distressed homes and recently failed to sell homes waiting to enter the market, we would expect to reach market equilibrium in 2013. I just don't think it can happen. There are thousands of distressed homes that still need to get sold, and just because they aren't listed for sale in the Tallahassee MLS does not mean they aren't having an impact on the supply side of the market. We will see more homes sold in 2013 than we have seen since 2007. Don't be surprised if we see distressed properties surpass 50% of all sales at some point. 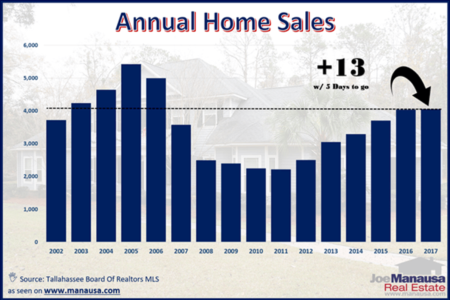 Our best case real estate forecast is that home sales in 2013 will double those recorded in 2011 (as we projected in our 2012 Real Estate Forecast), but it is more likely that the market will see a healthy growth without doubling. My optimism for 2013 could turn dark with more problems in the world banking community, and I still think that a poorly managed recovery could cause the housing market to head backwards. So ultimately, my real estate forecast for 2013 anticipates significant growth in unit sales and a slight decline or leveling off of home values, but don't underestimate our ability to do something stupid and send the market backwards with a rush of distressed homes entering the market. Thanks for another excellent and timely post: brief, clear, and to the point. My question: What do you see in your data and/or crystal ball for lots and land for 2013? Craig, we'll continue to see liquidations and banks releasing lots to builders early on. Then we'll have to see what happens with the distressed properties. IF they pour into the market, lot sales will die. If they stream into the market, then lot sales will sporadically occur where builders believe a niche might exist. I still think we'll be waiting for anything positive to occur for lots.